Hi everyone and welcome. 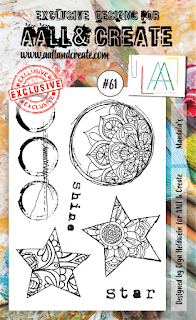 Today I have a new project to share with you using some beautiful stamps and stencils from AALL & Create. The background to this card began with me altering some Tim Holtz 'Memoranda' Paper Stash with several layers of Distress Paints (including Brushed Corduroy, Stormy Sky, Tumbled Glass and Picket Fence). I then stamped over it with a combination of one half of Olga Heldwein's 'Orbicular Graffiti' A4 stamp set and her coordinating 'Mandala's' A6 stamp set using Jet Black Archival Ink. Olga Heldwein's stamp sets coordinate so well with each other, combining graphic shapes and text in such well balanced compositions. I love how she's incorporated mandala designs inside several shapes because they are perfect places to add colour. In this case I used Sakura pens (Glaze 3D Rollers and a White Gelly Roll) as can be seen from the work in progress shot below. Carrying on with the circular motif I applied white texture paste through one of Autour de Mwa's stencils to add a line of three concentric circles to the background. And having cut out the stamped stars I layered them over some white gauze, finishing the card with a scattering of Mirrored Stars coloured with Rust Alcohol Ink. You can purchase Olga's stamp sets 'Orbicular Graffiti' and 'Mandala's' and Autour de Mwa's stencil #22 from AALL & Create HERE and they also available from many of your favourite retailers across the World (listed on the same page). Hopefully I've given you more ideas for using Olga Heldwein's stamp sets and Autour de Mwa's stencil. Make sure you check out the AALL& Create page on Facebook to see lots more inspiration from a host of hugely talented designers. That's it from me for today. Take care of yourselves and get creative! These stamps are amazing, so intricate and detailed. I also love the stencil work! Thanks for the share, looking forward to see more of your artwork. Keep up the posts! These stamps are killer! I especially am loving the circle with the mandala. A beautiful and very boho card. Really beautiful work and those stamps are also beautiful. Well coordinate graphics and well balanced text composition.